We have the multidisciplinary experience and capability to recruit a wide range of positions, from Senior Management to Support Staff. We are dedicated in the SOFTWARE recruitment’s. We have introduced an UPDATE concept for our customers for reference. This unique structure is designed to meet your demanding schedules and resource. 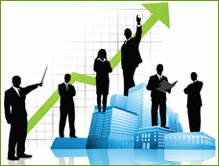 As leaders of global corporations, we also gain from your knowledge, experience and vision. Together we can create obvious understanding with each other and a partnership, which would be unique, generating new insights into critical issues of our business. We don’t assume we are the largest and the best, but we believe that selection interviewing and recruiting is an art of matching the individual vis-a-vis to the job description. So in all meeting your needs is our prime and sole objective. We are structured to provide you with a level of service desired by you, adding value at each level. Headhunting is a state of the art recruitment technique that proactively locates experienced, successful Candidates who may not respond to advertisements and brings them across our Client’s table for personal interaction. Such technique is applied when all other techniques applied by our Clients such as advertising and all usual search processes cannot deliver what they are looking for.